The Trade Off challenge borrows elements from other game-play challenges. It is a type of rotational challenge with members in the same household. It begins simply with two Sims that can only be controlled during assigned time frames. More on that later but first how about some background to get your creative storytelling juices flowing. The letter was handwritten on stationary embossed with a strange logo. The envelope has only your name and the logo with no return address. Thinking it is just junk mail you toss it in the bin but then take it back out again when you realize the writing was vaguely familiar. Was it from someone you knew? Just what kind of prank were they trying to pull? "You have been selected for a special project." Yea ... sure. Not going to fall for that trick. As you glance back down at the letter a phrase catches your attention "... and a vast fortune awaits when the assigned tasks are completed". Hmm this could be worth investigating even if it is a fake. "Just wait til I find out which of my friends sent this" you say thinking out loud. You decide it could be worth a good laugh and quickly make note of the address and arrange transportation. Who sent the letter? Was it an old friend or family member? Why was it sent to you ... for what purpose? There will be someone living on the same lot with you. Are you related, old colleagues or a previous romantic interest or perhaps an enemy from your past or a total stranger? Create a fresh household with Zero skills. Can be your own or from the gallery. Please give credit when using the creations of someone else. Appearance, aspirations and traits are up to you as long as are not to be compatible. **Must have at least one or more traits opposite the other. Example: One good or friendly the other mean or evil. Aliens and Vampires are allowed. You are encouraged to share your household using your own personal hashtag and hashtag #TS4TradeOff for this challenge. Neighborhood is up to you with a suggested 30x20 size lot. Two Sims will be living here BUT they are not sharing their space. Think of it as a duplex or two apartments. 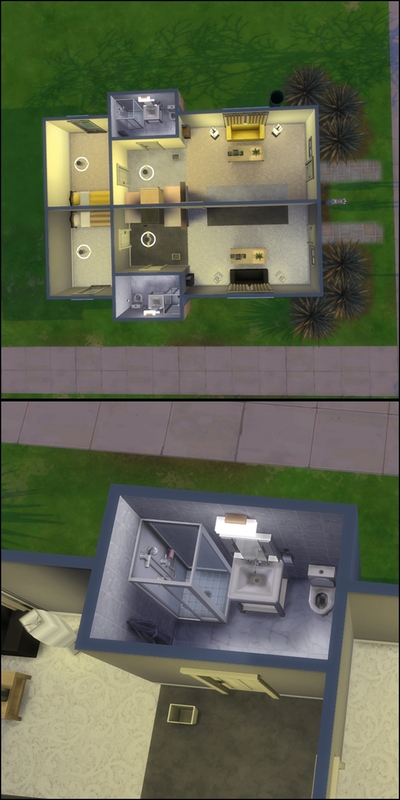 Each Sim will have their own living space with the same basic items. Entrance door locked to keep out the other Sim. The two households must share one common wall between them, with an optional door in between. If a door is placed, it may only be unlocked on SUNDAYS, and must remained "Locked to everyone" Monday-Saturday. *Optional shared kitchen. No shared wall with this option. Bathroom with toilet and tub or shower. A sink, fridge and at least one counter to prepare food. Stoves are optional to keep under budget but can be added later. Grills are okay but Sims tend to prepare food and not consume it so use with caution. If you have outdoor retreat you could use a cooler but no cooking skill is gained. Loveseat, sofa or bench for seating (or naps) and single bed for each. Bookcase, small stereo and/or TV for entertainment. These can also be added later to save on the lot budget. You are encouraged to share your starter or remodeled lots using your own personal hashtag and hashtag #TS4TradeOff for this challenge. Place the Duck Security SCR009E Super XL Smart Vault for each Sim to deposit and track their individual income. 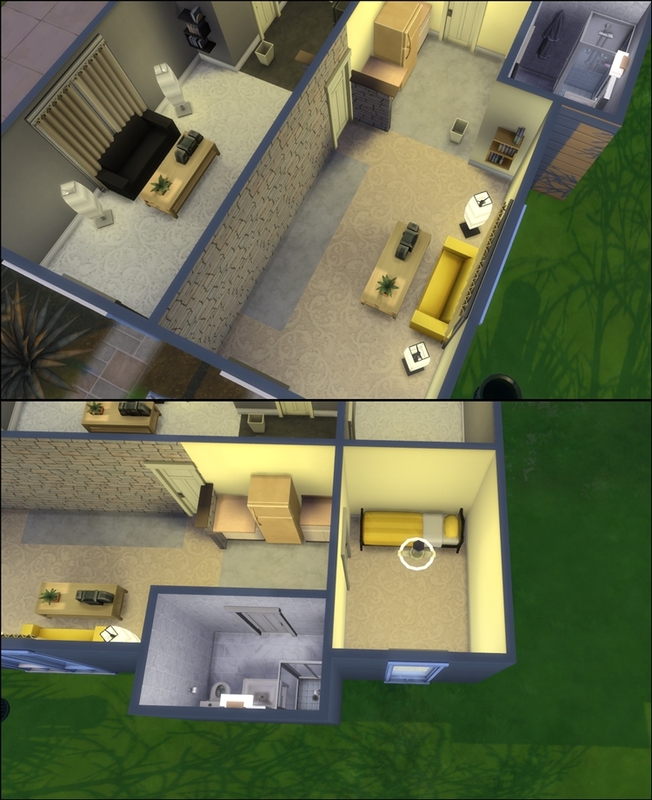 Duplex style with both sides outfitted two Sims to live independently. Original by #EQCreations #Duplex for #TS4TradeOff game-play challenge. Place on 30x20 to play the challenge. Aging is off for all Sims. Seasons is set at 14 days for each season. If you disable temperature effects on Sims you can still experience the weather without dying of extreme cold or heat. Move in day is on a Sunday. 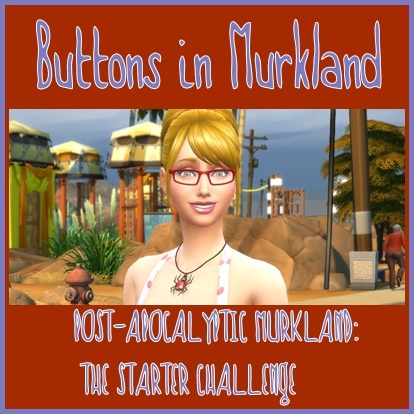 For the duration of the challenge this will be the only day both Sims can be controlled. They live on the same lot but not in a shared space. Seasons are set to 14 days to allow each Sim a full week of each season. It is also a way to track time spent playing. You may start on any Season of your choosing. If you do not have the Seasons pack you can use some other way to track the number of weeks played. Decide on the first Sunday who will be controlled that week. Every Monday will be the Trade Off day. Play this rotation thru at least eight Sim weeks. That will bring you back to the first day of your starting season and be a full Sim year. 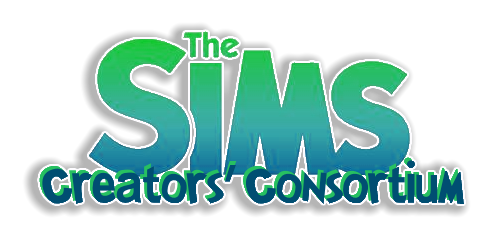 1) Each Sim to complete at least one Aspiration each. 2) Reach Skill Level 10 of one or more skills each. 3) Career Advancement - Highest level achieved. Settings of 14 days for each season makes eight weeks a full year. This can be the end of the challenge or you can continue to play. Uncontrolled Sim may be directed to go inside after returning from work. Adjust holiday activities to suit your gameplay style. Both Sims can be controlled during a holiday. *The uncontrolled Sim can be prompted to complete a holiday tradition. Thank you all for playing and commenting. Credit: Big thank you to my friends for play testing and contributing ideas to this challenge. I started testing this before all the rules were added. I decided not to use a vault to keep track of individual incomes. I have one main door for the condo and then the individual doors to the condos are locked for each sim and their dog. I finished by attempt I really enjoyed this challenge. It's pretty quick so that was really nice. I liked switching back and for the between sims each week. This looks interesting! May give it a go this afternoon. OhBoy! Uncontrolled Sims do the craziest things! Hoping you enjoy the challenge. I had a few questions about travel. Can the sim under control go to the jungle for vacation and leave the other at home? Or should they go together and same rules on controlling them be applied? Should they have a limit on days gone? Yes the controlled Sim can travel on vacation during their week. Taking the other Sim is optional. I had not set a limit for days on vacation. Okay, thanks! I have a couple of dudes I made for this. Total opposites except they both like to investigate things. One explores outdoors in the jungle and the other is going to be a Strangerville conspiracy theorist. Excited to see how their story turns out! @Pallystyle Now that does sound like an interesting story! Ahhah...um, well both of my sims have died. One in the jungle temple from fire and the other was ate by mother plant. I am not sure where to go from here. I am thinking of re doing it and maybe building a few skills before I send the one sim off to the jungle. I also had separate kitchens for them I think I will do a shared one this time because they rarely interacted of their own accord. The one sim just stayed inside his room on his cell phone when I was not playing him. Played some today then realized I never set the seasons to 14 days. So I am going to do two rounds of seasons. I have been switching each sim I play when each new week starts. I think I picked poorly for their jobs and aspirations at first. I am about to start the last week and they are not going to max their jobs. I had one guy trying out the acting career. I will probably play through to the end to see how close I can get.